The UK Space Agency and European Space Agency have invited viewers of the UK children's TV program Blue Peter to design the mission patch for astronaut Tim Peake. Britain's first official astronaut is in need of a proper space mission patch, and he is turning to the young viewers of a UK children's television program to design it. Blue Peter, the longest-running kids' TV show in the world, has partnered with the UK Space Agency (UKSA) and the European Space Agency (ESA) to design an emblem for British astronaut Tim Peaketo wear into space. In 2015, Peake will become the first ESA astronaut from the United Kingdom to fly to the International Space Station. The contest, which was launched on the Blue Peter show and its website on Thursday (Sept. 4), runs through Sept. 26. The winning design will be revealed on Nov. 20. Blue Peter presenters Barney Harwood and Lindsey Russell help to announce the mission patch contest on television. The child who designs the winning emblem will not only have the honor of creating Peake's official mission patch, but will also be invited to meet the astronaut and appear on Blue Peter to show their artwork on live television. Five runner-ups will receive a framed copy of their design and a photograph signed by Peake. "Blue Peter has a long history of giving fantastic once in a lifetime opportunities to its audience and this competition will definitely be one of those," Ewan Vinnicombe, editor of Blue Peter, said. "We are looking forward to seeing the brilliant designs we're sure our viewers will come up with." Aired on the CBBC channel in the UK, Blue Peter is aimed at viewers between 6 and 15 years old. The show's on-air presenters, Barney Harwood, Lindsey Russell, and Radzi Chinyanganya helped to announce the patch art contest, which is seeking creative and imaginative designs inspired by Peake, his mission and space exploration. Peake is scheduled to lift off on Russia's Soyuz TMA-19M spacecraft with cosmonaut Yuri Malenchenko and NASA's Tim Kopra in November 2015. Once onboard the orbiting laboratory, Peake and his crewmates will join the station's 46th expedition. He will be in space for about six months. In July, ESA revealed "Principia" as the name of Peake's European mission. Selected through a similar contest, the name refers to physicist Isaac Newton's three-part text on physics, "Naturalis Principia Mathematica," describing the principal laws of motion and gravity. "I am delighted with this name that honors one of Britain's most famous scientists," Peake said. "I hope it will also encourage people to observe the world as if for the first time — just as Isaac Newton did." Before joining ESA's astronaut corps in 2009, Peake was a helicopter pilot and a test pilot. In addition to training for his upcoming spaceflight, he serves as an ambassador for the UK Space Agency and has helped in the development of the agency's microgravity research program. "This [mission patch] design competition is one of many opportunities for young people and families to get involved in Tim's [flight], one which will shape the future of Britain's space program and inspire generations," Greg Clark, UK minister for universities, science and cities, said. "I hope all Blue Peter viewers will reach for the stars and enter this competition." "Good luck with the challenge and I'm looking forward to seeing your fantastic ideas!" added Peake. 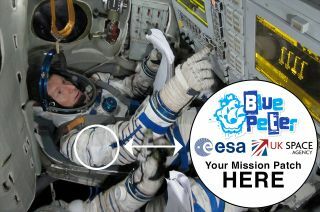 For more information or to enter the mission patch design contest, visit CBBC's Blue Peter website.